I have done what was just and right, O Lord, let not the proud calumniate me: I have walked upright in the ways of thy commandments: I have hated every evil way. O God, the bestower of all good gifts, who in thy servant Bibiana joinedst the palm of martyrdom with the flower of virginity, grant that through her intercession our hearts may be united to thee by charity; and that being delivered from all dangers, we may obtain the everlasting rewards. Through our Lord Jesus Christ, thy Son, who liveth and reigneth with thee, in the unity of the Holy Ghost, God, world without end. Amen. Of the Saints, whose feasts are kept during Advent, five are Virgins. The first, St. Bibiana, whom we honour to-day, is a daughter of Rome; the second, St. Barbara, is the glory of the Eastern Churches; the third, St. Eulalia of Merida, is one of Spain's richest treasures; the fourth, St. Lucy, belongs to beautiful Sicily; the fifth, St. Odila, is claimed by France. These five wise Virgins lighted their lamps and watched, waiting for the coming of the Spouse. Such was their constancy and fidelity, that four of them shed their blood for the love of Him, after whom they longed. Let us take courage by this noble example; and since we have not, as the Apostle expresses it, as yet resisted unto blood, let us not think it hard if we suffer fatigue and trouble in the holy exercises of this penitential season of Advent: He, for whom we do them all, will soon be with us and repay us. To-day, it is the chaste and courageous Bibiana, who instructs us by her glorious example. 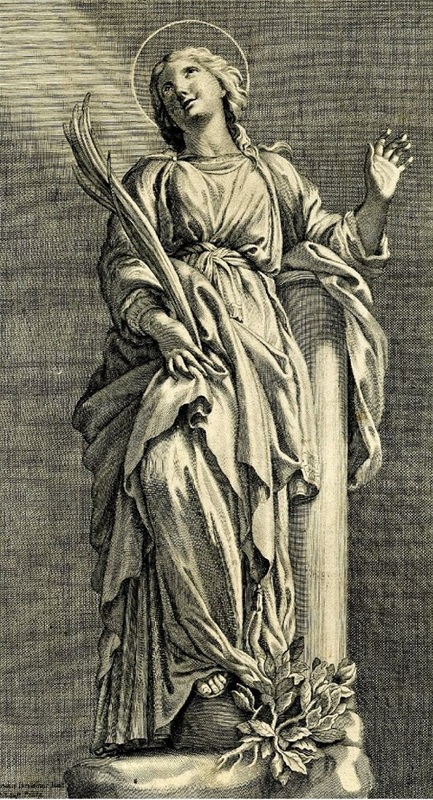 Bibiana was a Roman Virgin, noble by birth, but more noble by her profession of the Christian faith. For, under the most wicked tyrant Julian the Apostate, Flavian, her father, was deprived of his dignity of prefect, and being branded with the mark of slavery, he was banished to Aquӕ Taurinӕ, and there died a martyr. Her mother, Dafrosa, was first shut up in her own house with her daughters, that she might die by starvation; but shortly afterwards was banished from Rome and beheaded. The virtuous parents thus put to death, Bibiana was deprived of all her possessions, as also was her sister, Demetria. Apronianus, the City Prӕtor, thirsting after their wealth, persecutes the two sisters. They are bereaved of every human help. But God, who gives food to them that are in hunger, wonderfully nourishes them; and the Prӕtor is exceedingly astonished on finding them in better health and strength than before. Apronianus, notwithstanding, endeavours to induce them to venerate the gods of the Gentiles. If they consent, he promises them the recovery of all their wealth, the Emperor's favour, and marriage to the noblest in the empire: but should they refuse, he threatens them with prison, and scourgings, and the sword. But neither promises nor threats can make them abandon the true faith; they would rather die, than be defiled by the idolatrous practices of paganism; and they resolutely resist the impious Prӕtor. Whereupon, Demetria was struck down in the presence of Bibiana, and slept in the Lord. Bibiana was delivered over to a woman by name Rufina, who was most skilled in the art of seduction. But the virgin, taught from her infancy to observe the Christian law, and to preserve with the utmost jealousy the flower of her virginity, rose above nature, defeated all the artifices of the wretched Rufina, and foiled the craft of the Prӕtor. Finding, therefore, that Rufina could in no wise shake the virgin's holy resolution, and that both her wicked words and frequent blows were of no avail; and seeing his hopes disappointed and his labour thrown away; the Prӕtor became violently enraged, and ordered Bibiana to be stripped by the lictors, to be fastened to a pillar with her hands bound, and to be beaten to death with leaded whips. Her sacred body was left for two days in the Bull-Forum, as food for dogs; but received no injury, being divinely preserved. A priest called John then buried it during the night, close to the grave of her sister and mother, near the Palace Licinius, where there stands at this day a Church consecrated to God under the title of St. Bibiana. Urban VIII restored this Church, having there discovered the bodies of Saints Bibiana, Demetria, and Dafrosa, which he placed under the high altar. Another account of St. Bibiana. We are informed by Ammianus Marcelinus, a pagan historian of that age, and an officer in the court of Julian the Apostate, that this emperor made Apronianus governor of Rome in the year 363, who, while he was on the way to that city, had the misfortune to lose an eye. This accident he superstitiously imputed to the power of magic, through the malice of some who excelled in that art; and, in this foolish persuasion, to gratify his spleen and superstition, he resolved to punish and exterminate the magicians; in which accusation Christians were involved above all others, on account of many wonderful miracles which were wrought in the primitive ages. Under this magistrate, St. Bibiana received the crown of martyrdom. This holy virgin was a native of Rome, and daughter to Flavian, a Roman knight, and his wife Dafrosa, who were both zealous Christians. Flavian was apprehended, deprived of a considerable post which he held in the city, burned in the face with a hot iron, and banished to Acquapendente, then called Aquӕ Taurinӕ, where he died of his wounds, a few days after. Dafrosa, by an order of Apronianus, who had thus treated her husband for his constancy in his faith, was, on the same account, confined to her house for some time; and, at length, carried out of the gates of the city, and beheaded. Bibiana and her sister Demetria, after the death of their holy parents, were stripped of all they had in the world, and suffered much from poverty for five months, but spent that time in their own house in fasting and prayer. Apronianus had flattered himself, that hunger and want would bring them to a compliance; but seeing himself mistaken, summoned them to appear before him. Demetria, having made a generous confession of her faith, fell down and expired at the foot of the tribunal, in the presence of the judge, Apronianus gave orders that Bibiana should be put into the hands of a wicked woman named Rufina, who was extremely artful, and undertook to bring her to another way of thinking. That agent of hell, employed all the allurements she could invent; which were afterwards succeeded by blows: but Bibiana, making prayer her shield, remained invincible. Apronianus, enraged at the courage and perseverance of a tender virgin, at length passed sentence of death upon her, and ordered her to be tied to a pillar, and whipped with scourges loaded with leaden plummets till she expired. The saint underwent this punishment cheerfully, and died in the hands of the executioners. Her body was left in the open air, that it might be a prey to beasts; but, having lain exposed two days, was buried in the night, near the place of Licinius, by a holy priest called John. Peace being soon after restored to the church, a chapel was erected over her tomb; and, a hundred years after, in 465, Pope Simplicius built there a fair church, as Anastasius mentions in his life. This church was called Olympina, from a pious lady of that name, who defrayed the expenses. It was repaired by Honorius III, but being fallen to decay was afterwards united to St. Mary Major, till it was sumptuously rebuilt by Urban VIII in 1628, who placed in it the relics of SS. Bibiana, Demetria, and Dafrosa, which were discovered in that place which has been sometimes called St. Bibiana's cemetery. The only affair which a Christian has in this world, and in which consists all his happiness and joy, is to seek God, to attain to the perfect possession of his grace and love, and in all things most perfectly to do his will. By this disposition of heart he is raised above all created things, and united to the eternal and unchangeable object of his felicity. He receives the good things of this world with gratitude to the Giver, but always with indifference; leaves them with joy, if God requires that sacrifice at his bonds; and, in his abundance, fears not so much the flight of what he possesses as the infection of his own heart, or lest his affections be entangled by them. Such attachments are secretly and imperceptibly contracted, yet are ties by which the soul is held captive, and enslaved to the world. Only assiduous prayer and meditation on heavenly things, habitual self-denial, humble distrust and watchfulness, and abundant alms-deeds proportioned to a person's circumstances, can preserve a soul from this dangerous snare amidst worldly affluence. Also Read – December 2, 2018: I Sunday of Advent (Holy Season of Advent begins).